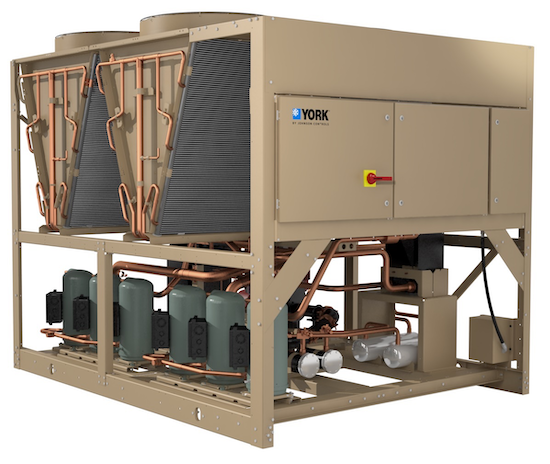 Johnson Controls has expanded its line of YORK® YLAA Air-Cooled Scroll Chillers with two new models that offer a smaller footprint with increased efficiency. The new models expand the product range from 40 to 230 tons without sacrificing quality and efficiency. The extended line, which reduces total cost of ownership with savings up to 30%, will be available through the YORK 041 and 048 models. The expanded line of YORK YLAA Air-Cooled Scroll Chillers maintains the high level of quality and efficiency of previous models. The YLAA scroll chillers are equipped with two independent circuits for partial redundancy. Brazed plate evaporators and microchannel condensers enable more efficient heat transfer to help reduce total cost of ownership. The new models are available this spring as part of the Quick Ship Stock program, providing a delivery within two to five days in the contiguous United States and Canada. Additionally, made-to-order options including louvers and variable speed drive condenser fans to further enhance part-load efficiency and sound, as well as integral pump packages that offer a single purchase, shipment and install solution. The environmental design of the YLAA includes zero-ODP HFC-410A refrigerant and up to 50% less refrigerant charge. Units include full-load and part-load efficiencies that meet or exceed ASHRAE standards. The unit is also equipped with native building automation system (BAS) communications, including BACnet®, Modbus and N2. Johnson Controls is a global diversified technology and multi-industrial leader serving a wide range of customers in more than 150 countries. Our 120,000 employees create intelligent buildings, efficient energy solutions, integrated infrastructure and next generation transportation systems that work seamlessly together to deliver on the promise of smart cities and communities. Our commitment to sustainability dates back to our roots in 1885, with the invention of the first electric room thermostat. We are committed to helping our customers win and creating greater value for all of our stakeholders through strategic focus on our buildings and energy growth platforms. For additional information, please visit www.johnsoncontrols.com. Johnson Controls Building Technologies & Solutions is making the world safer, smarter and more sustainable – one building at a time. Our technology portfolio integrates every aspect of a building – whether security systems, energy management, fire protection or HVACR – to ensure that we exceed customer expectations at all times. We operate in more than 150 countries through our unmatched network of branches and distribution channels, helping building owners, operators, engineers and contractors enhance the full lifecycle of any facility. Our arsenal of brands includes some of the most trusted names in the industry, such as Tyco®, YORK®, Metasys®, Ruskin®, Titus®, Frick®, PENN®, Sabroe®, Simplex® and Grinnell®. For more information, visit www.johnsoncontrols.com.